Here at Rim Tours 435.259.5223 (and also at all Moab bike shops) you will find people happy to provide answers. • Will I run out of trails to ride? 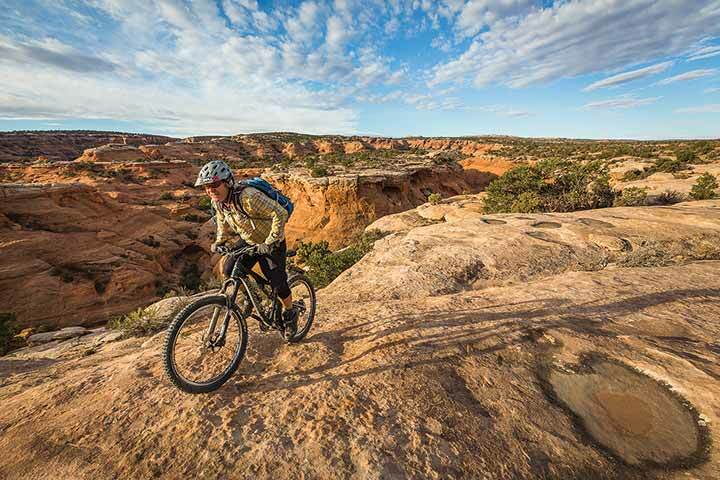 Moab has over 150 miles of singletrack mountain bike trails within easy reach of the main population center. The average rider could spend an entire week in Moab and ride from a different trailhead each day without repeating. From Klondike Bluff in the north, Navajo Rocks and Dead Horse Point in the west, to the Slickrock Trail in the east, Moab has an abundance of trails to explore. Most trail systems are very well mapped, with signs at major trail intersections showing your current location on a map of the area with individual trails color-coded for the skill level required. Moab trails are often a degree more difficult than many visitors are accustomed to. Green, Blue, and Black ratings are relative grades. In Moab, some green or blue trails may be more challenging than the green and blue-rated trails back home. There is no minimum age. But all riders need to be capable of operating their bike safely. Most Moab bike shops require an adult to sign for bike rentals to minors. The best place to ride with kids is the Moab Brands Trailhead, which has a warm-up “corral” next to the parking lot and features one of the easiest green-rated trails — the Bar M Loop — which is wider than most. 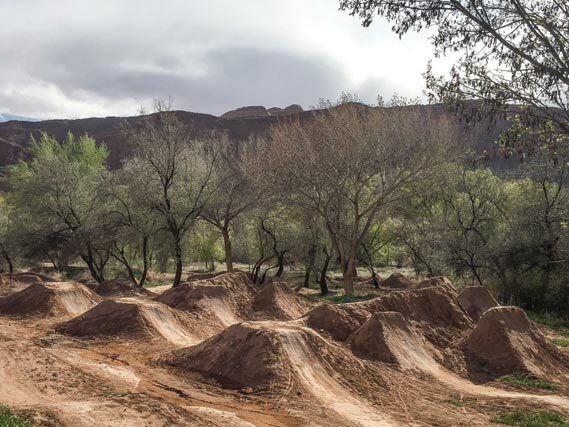 Moab also has a well-loved BMX Bike Park called Anonymous Park, located in town on 500 West. The land was donated by an anonymous donor, thus the name. It was built by the Moab Bike Park Committee through the Moab Trail Alliance. Helmets are a must and appropriate padding is encouraged. Many of the trails we ride are for non-motorized vehicles, only. Technically, e-bikes are treated as "motorized" by most land management agencies that regulate the trails (BLM, USFS, NPS.) The Travel Council publishes an excellent guide about e-bike access on their website discovermoab.com. 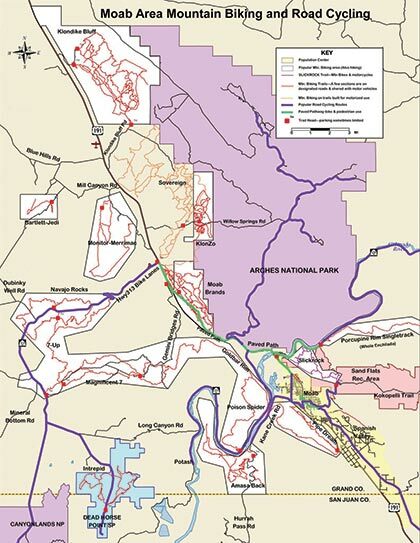 It explains that most of the singletrack trails and bike paths in the area were constructed using federal Non-Motorized Alternative Transportation Funds and grants that specify non-motorized use of the trail. However, e-bikes are allowed on almost all of the numerous, amazing jeep roads/trails throughout the Moab area, including the renowned Slickrock Trail. There are several professional shuttle services specifically for mountain bikers in Moab (most also do river and hiking shuttles, as well.) The main trailheads that they serve are The Moab Brands, Magnificent 7 and The Whole Enchilada/Porcupine Rim. • What about Guided Tours? There a number of companies available to take you on a guided mountain bike tour. Rim Tours offers 15 different half-day guided tours that include everything: bike rental and insurance, helmet, waterbottle (which you can keep afterwards as a souvenir,) ground transportation from Main Street out to trailhead and back, plus plenty of helpful riding tips from the guide (gratuity encouraged.) Full-day tours include a delicious lunch and are offered during the spring and fall.